The world is complex and wicked. Don’t drown. Cassis specialises in providing strategic advice to clients in the life sciences and healthcare sectors. Established in 1997, Cassis is a specialist consultancy operating globally. Clients know that the advice is independent and built on a sound foundation of knowledge and informed analysis, with expertise in healthcare and hospitals, business strategy and the impact of the policy environment. Commodified quick fixes, canned solutions and yesterday’s solutions are just not good enough for the people charged with leading organisations, companies, or teams. From our experience in healthcare and life sciences, we can develop deep insight which leads to action. 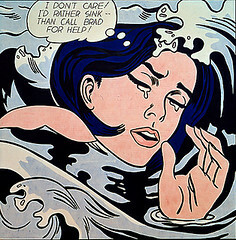 The painting is by Roy Lichtenstein, “Drowning Girl”, 1963, displayed in the permanent collection of the Museum of Modern Art, New York.